In February 2018, I went on a three-week painting binge … in India! Yes. 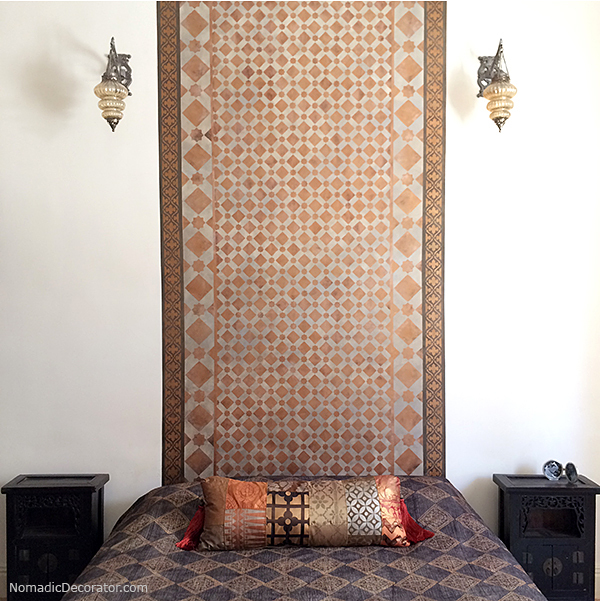 I painted stencils all over three walls, canvasses, carved wood, backplates for sconces. It was the best three weeks ever. Despite having a bad cold, and terrible hacking-coughing 10 feet up on a ladder. 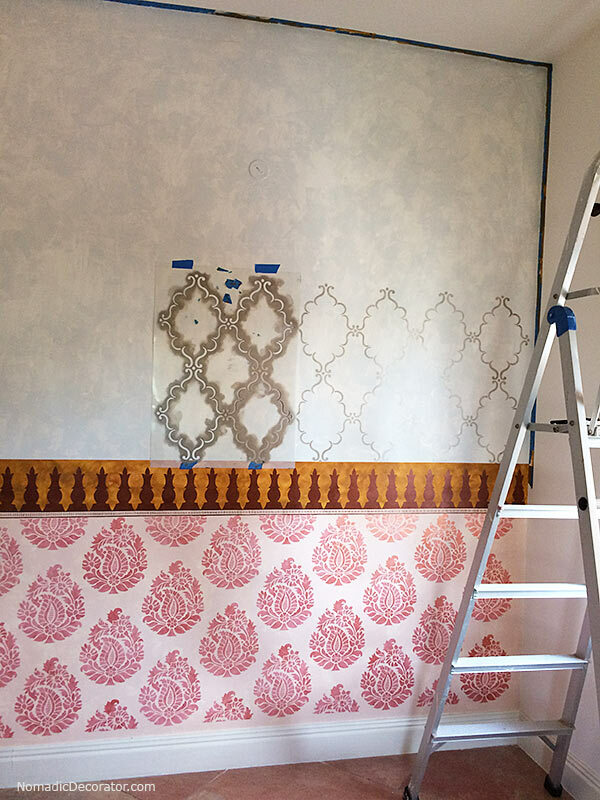 But hey, I stenciled to the tippy-top of those 10 foot walls! This was one wall I painted. 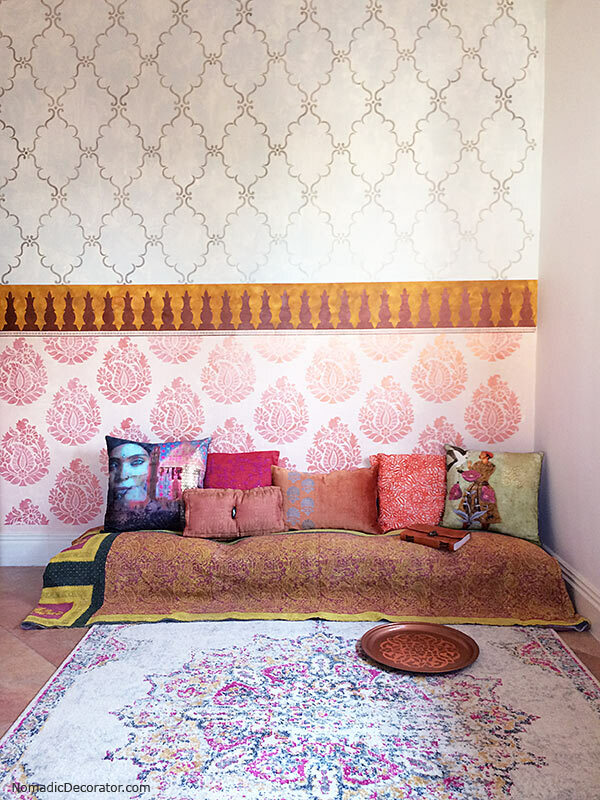 Imagine this as the background of … SOME DAY … a four-poster daybed of carved wood with fantastical India motifs. Painted light gray. Draped with sheer sarees cascading down the posts. 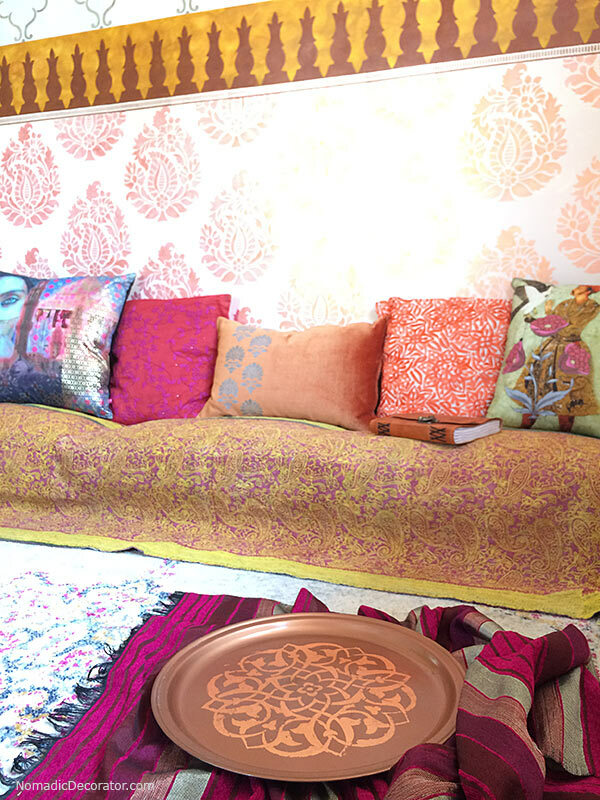 And slathered with kantha quilts and pillows in bright pinks, oranges and blues with just a touch of that mustard color. Some day this will be a fully-complete guest room. For now, it’s my husband’s office when he’s in Chennai, India. And this wall probably isn’t what he was expecting! But he still has a more professional plain white wall for his GoToMeeting and Skype calls from the desk in the corner. 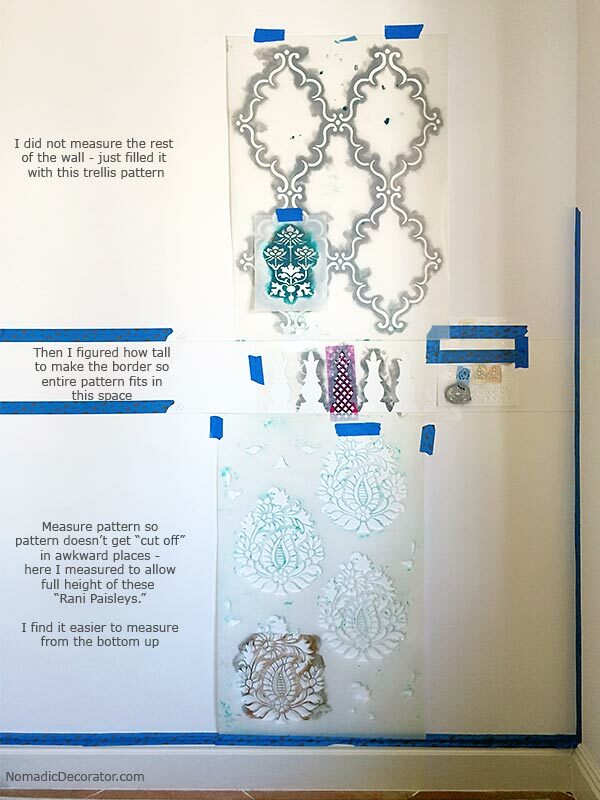 So … here’s a step by step of how to “build” a stenciled wall like this. I will warn, there’s some measuring to do. A yardstick or measuring tape does the math for you. The stencil at the bottom is “denser” and will be filled with a lot more paint than the “lighter” trellis pattern on the top. So I balanced a denser/heavier pattern with a lighter pattern. The paisley and trellis patterns have curvy lines, so I chose a blockier geographic type stencil for the border in the middle. So those are some ways you can get contrast. 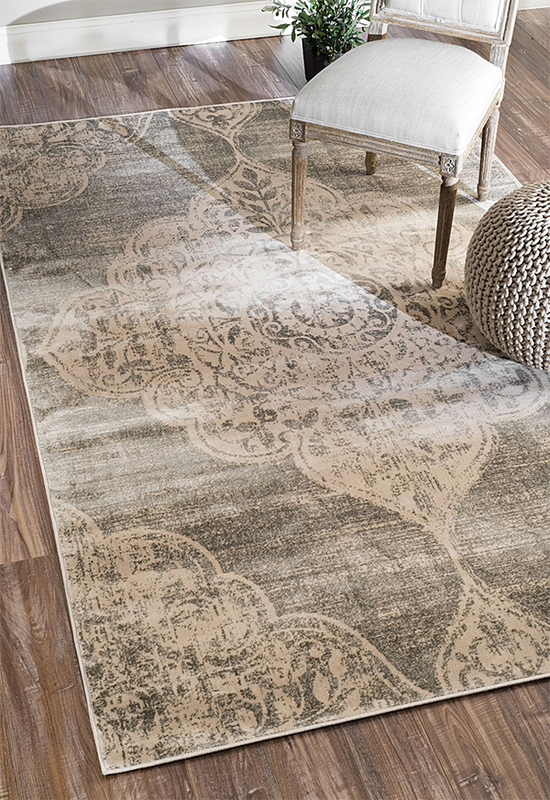 You can also pair big stencil patterns with small patterns. 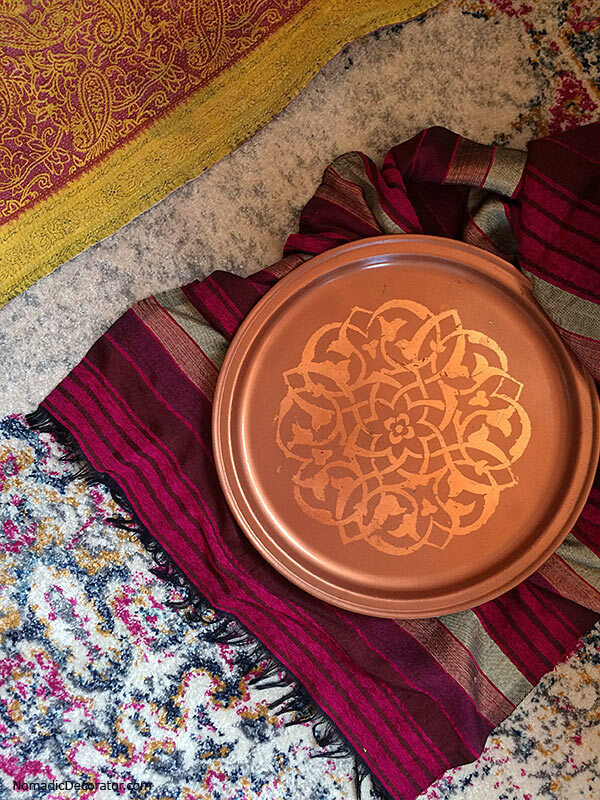 Mix florals with straight-edge geometrics. Now, decide if you want different color backgrounds behind your stencils. You don’t have to do backgrounds. Different backgrounds add extra dimension, but they also add extra time and difficulty. 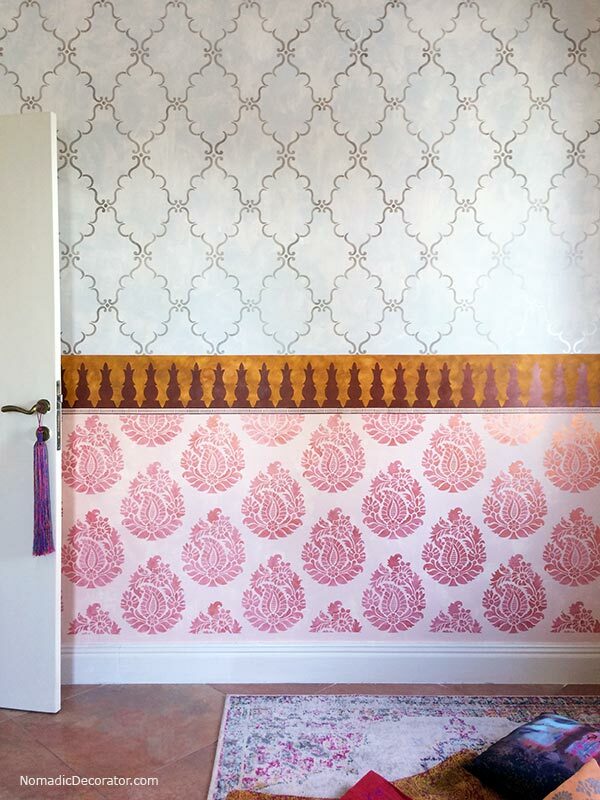 If you want, you could just paint the stencils, with the wall the same color behind all stencils. But if you want different background colors, measuring is important. 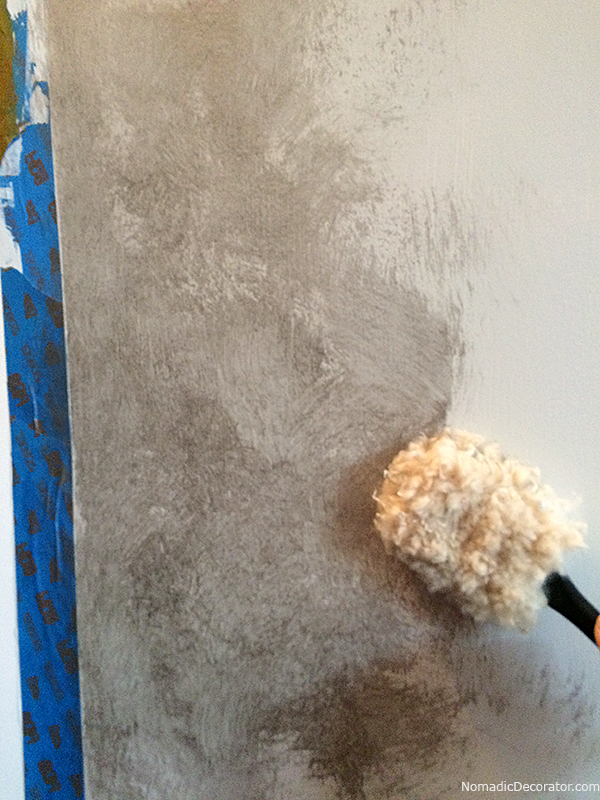 As you see above, I started taping the wall to mark where background colors would be painted. I measured the bottom section first, then I measured for the border in the middle. I drew pencil lines on the wall. You can see these lines just barely in the photo above near the middle border area. 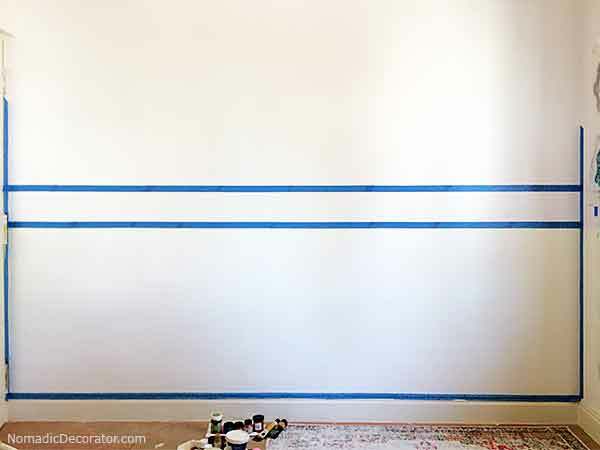 You will have to keep moving the blue lines from one side of the pencil lines to the other, and tape over areas you just painted, so be careful. 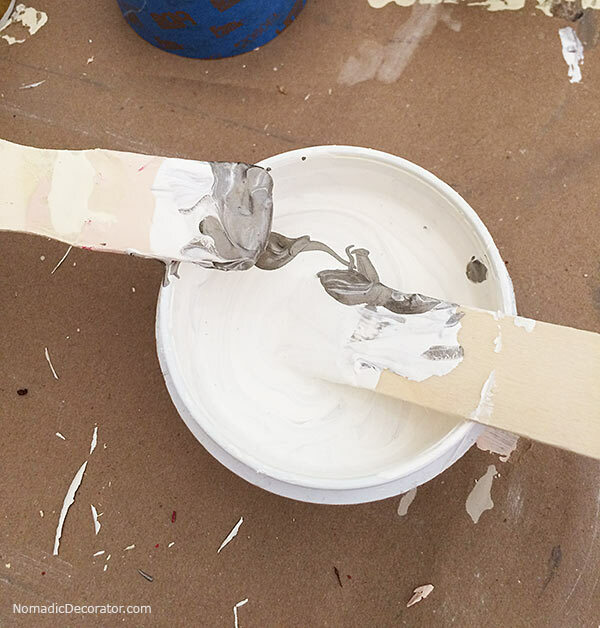 Paint should have enough time to dry so you don’t pull it off with the tape. 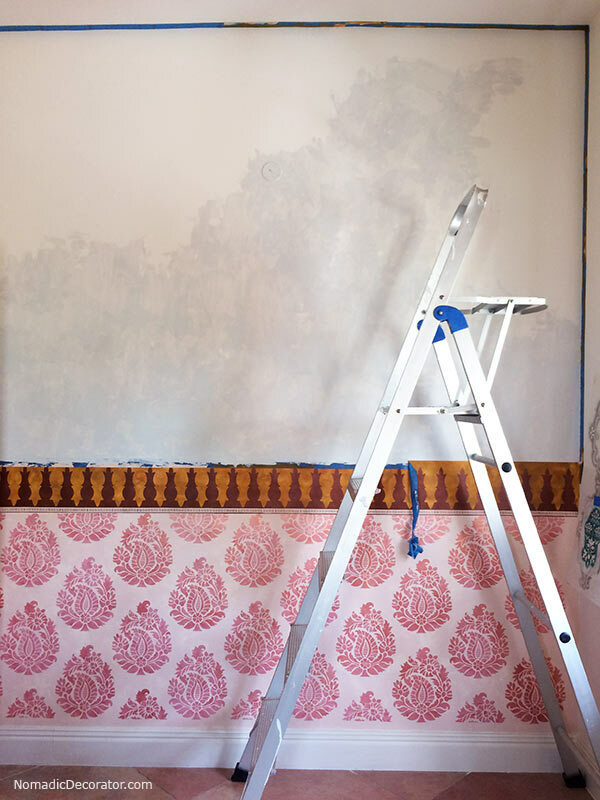 I decided to play up the pink, and bring the grays and silvers to the top of the wall to give the eye a rest from the color crazy that will eventually fill much of the room. And for contrast to the feminine pinks and curves, I chose the mustardy-turmeric-curry color for the border. Starting with warm creamy ivories and adding red made a warm dusty pink. I was channeling the Pink City of Jaipur. 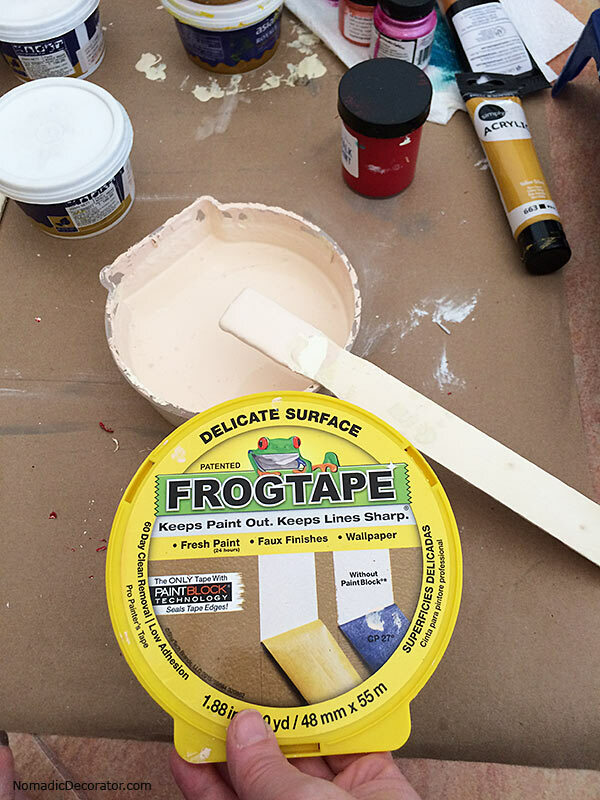 I had limited supplies, so I mixed this in a Frog Tape container! Asian Paints paint sticks to everything, plus I don’t know where the water drains from our India apartment or the effects of paint going down our drains. So I didn’t clean the container, I just threw it out. There’s a few guys who live near the community garbage bins who make money from pulling garbage and recycling it. They watch for us. They LOVE our garbage! 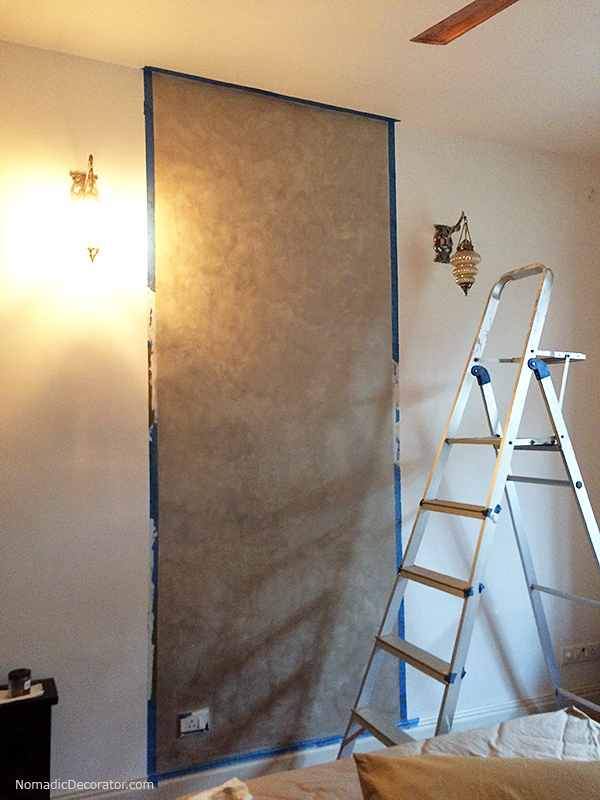 I wanted an uneven, plaster-y look on the wall. 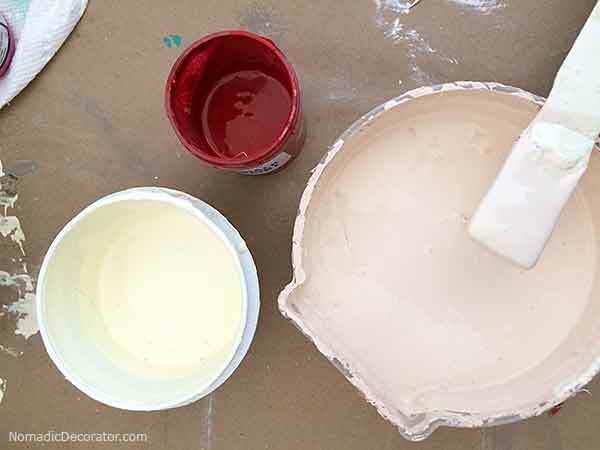 So I spread light amounts of paint on a trowel – honestly, a cheap and BROKEN plastic trowel, the only thing I had available in India – and troweled the latex paint on the wall. The broken trowel got annoying. I had to be careful to not make sharp scratches with it. But, it worked okay. I eventually had to break off the broken part. I moved the trowel every which way like drunken hashmarks, for an uneven application. It went very fast. I let some splotches of the original white paint show through. 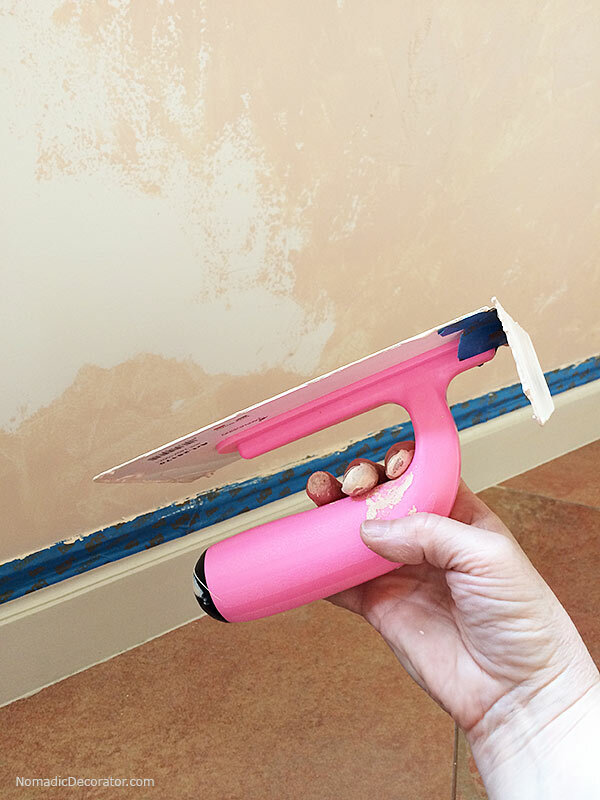 Because the trowel applied a light layer, the paint dried fast. Though it’s hard to tell from the pictures because it looks pink, I chose the orange in the middle. I forget which paint it was now. It’s a metallic that has orange & pink. 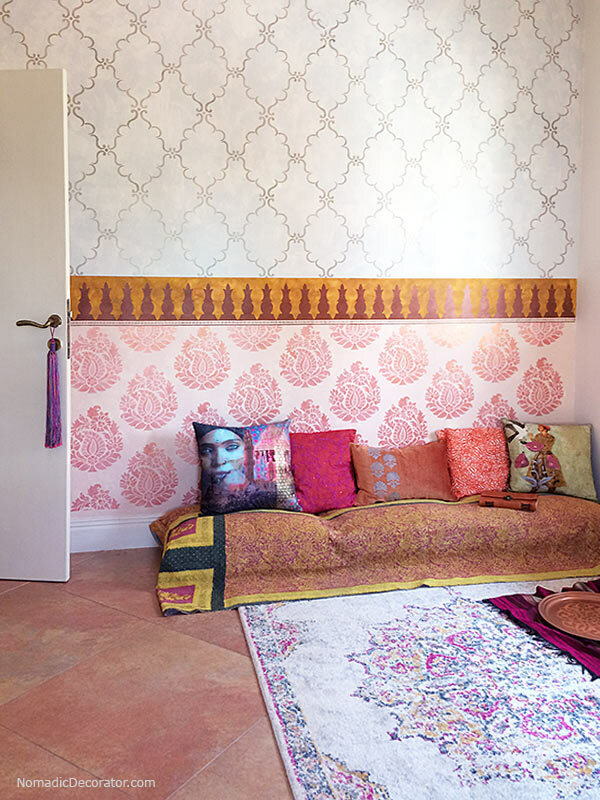 The stencil is the Rani Paisley Stencil from Royal Design Studio in furniture stencil size. You can also get it bigger in wall stencil size. You can see I finished one entire section – background + stencil – before moving up to the next section. Unfortunately I did not photograph every step of the border section. It got dark out. This room is lit with two lousy lightbulbs. I could barely see with my eyes wide open. Honestly I think I was doing all this at 2 a.m. Because jetlag. And, you can see I did crazy stuff with a skinny border line for extra credit or something, even though there’s no teacher to impress, it’s just myself. I don’t even know how to explain how to measure to get the curry color background behind the big geometric shapes, and the pink background behind those skinny lines. That really needed to be a video to show you. Just … measure twice, then measure again, and measure again. Test a small area first before painting the whole thing. Test in an area that’s usually behind a door, curtain or cabinet, somewhere not seen so well. You can always paint over it and start over if you measured wrong. Or sometimes a better idea is to not drive yourself crazy with all this measuring in the first place. Why didn’t I think of that. At some point it was light out again. And it must have been hot, because the ceiling fan is running. Now it’s time to paint the top. And climb up the ladder and try not to get hit by the ceiling fan! 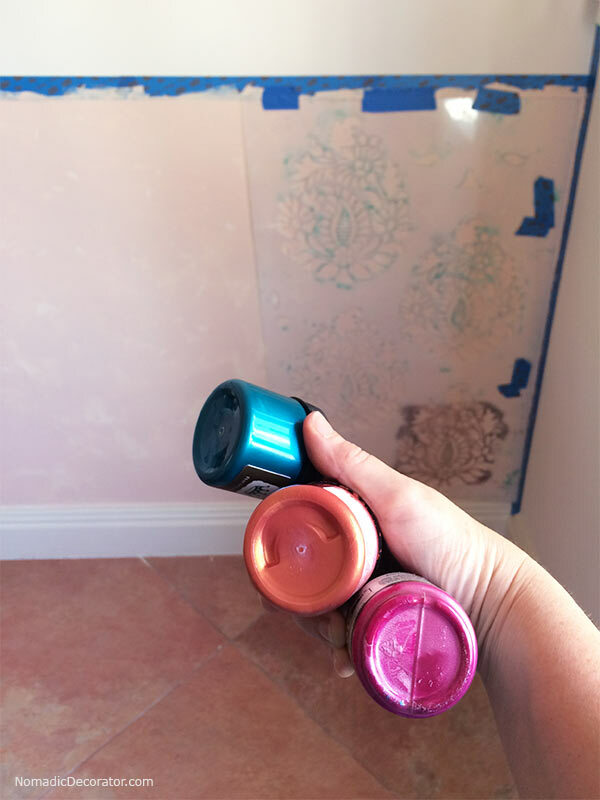 You can see here, the pink on the bottom relates to the pink in the floor tile, and the dark copper in the border relates to the copper in the ceiling fan. 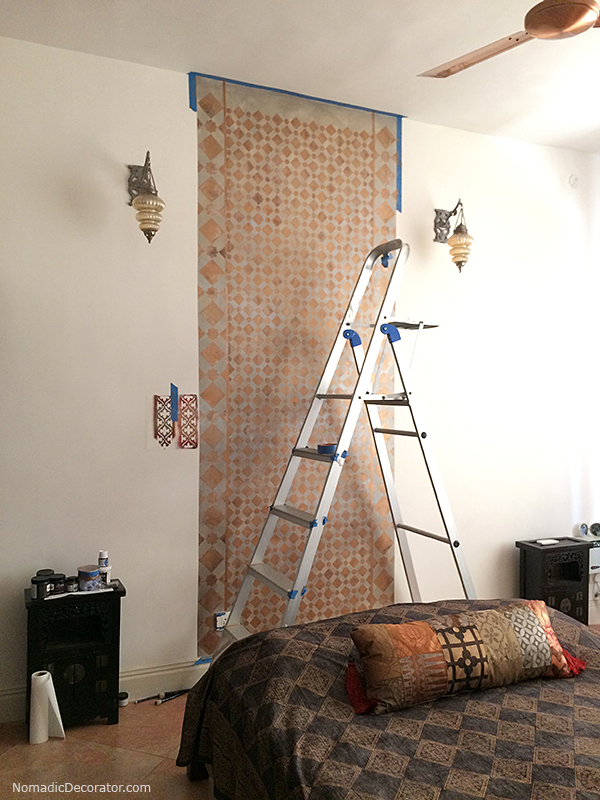 Also on the other end of the room, there are dark copper wall sconces and some curry/tamarind color on the wall. So these colors get repeated around the room. Now, I wanted a silvery gray background on the top. 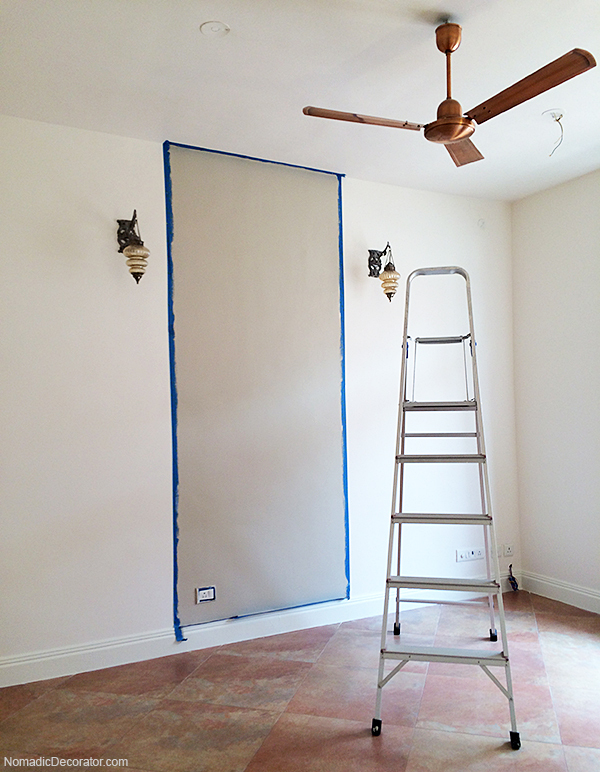 I stared at the wall for awhile and wondered if I should go bold, really BOLD, and paint bright color on the top too. But honestly, all this color is pushing it for me personally. And it’s feeling more feminine than what I’m comfortable with. So I decided to tame things down just a little bit by painting tones of silvery gray on the top. 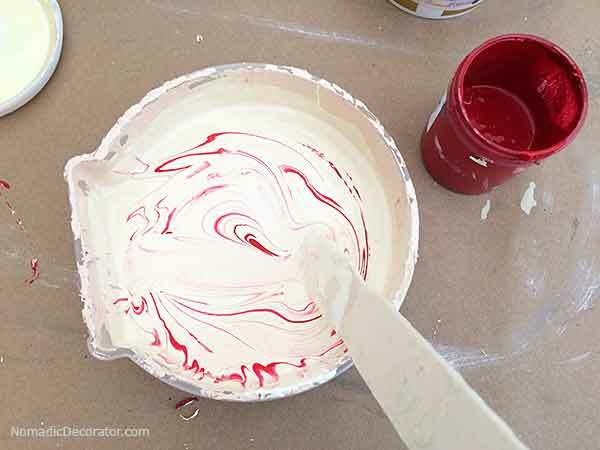 I pulled white latex paints with cool undertones from Asian Paints from my stash of sample paints. 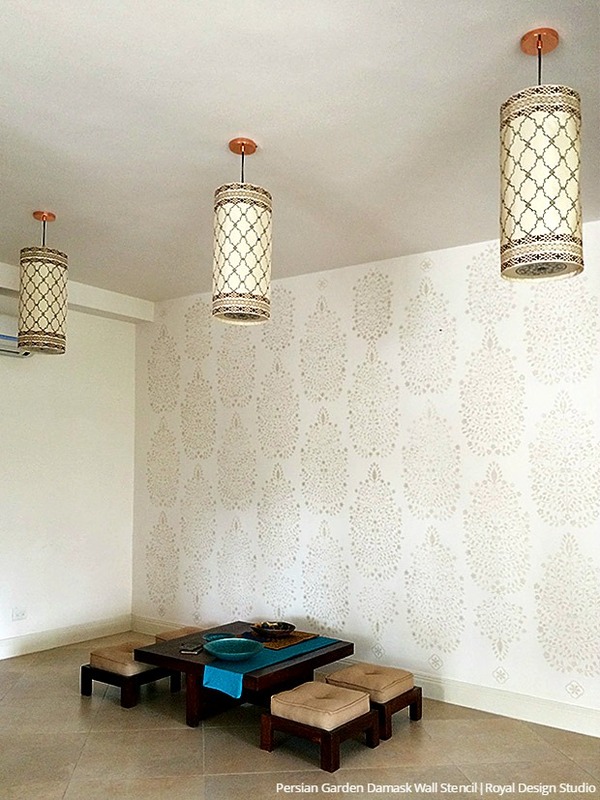 Then, mixed Aged Nickel Stencil Creme from Royal Design Studio into the Asian Paint whites. 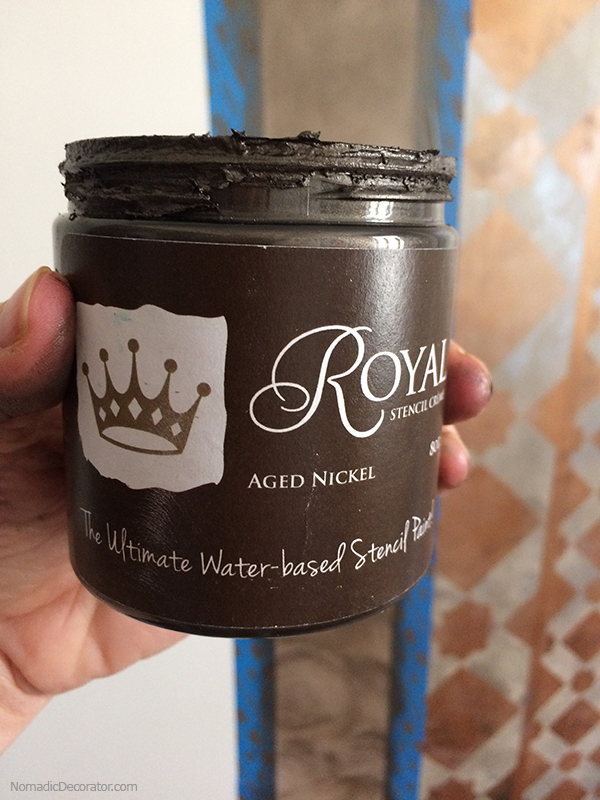 The Aged Nickel has shimmer and sheen so it added a metallic glimmer to the latex paint. I was also hoping I wasn’t compromising the Asian Paints with this mixing, but as I write this, the paint has been on the wall for a year, my husband has visited the apartment recently, and the walls are fine. The colors I added are a very small % of the paint. 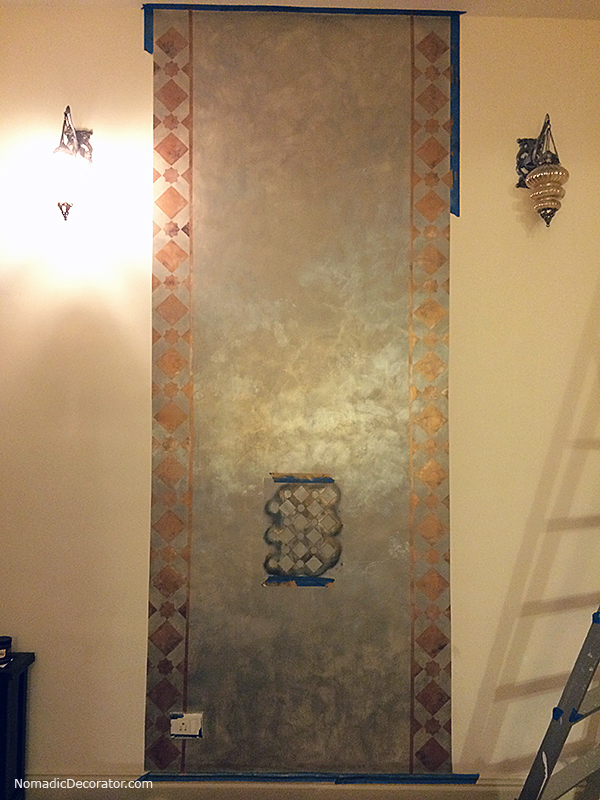 Then, I stenciled the trellis stencil with straight up Aged Nickel Stencil Creme for a tone on tone look. 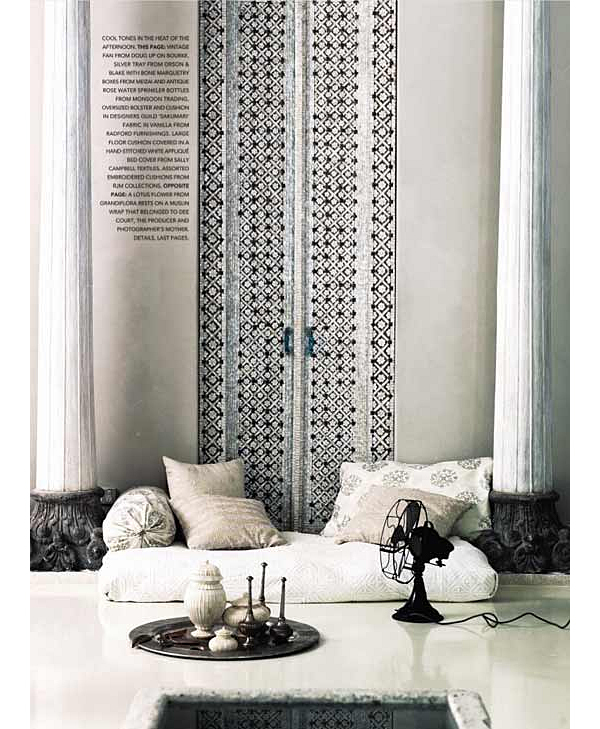 The stencil is the Raj Indian Trellis Stencil from Royal Design Studio. Things are getting shadowy again, so another day has gone by. On the Third Day, She Styles! Finally finished! 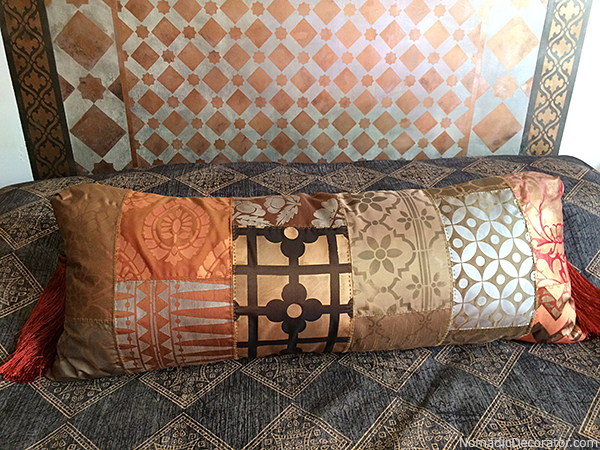 We don’t have furniture for this room yet, so I pulled in sofa cushions from the living room and styled them up like a Moroccan floor seating situation. Just pretend there’s chai tea or mint tea. As the sun sets again, the colors deepen and get mysterious. Time to relax and enjoy! 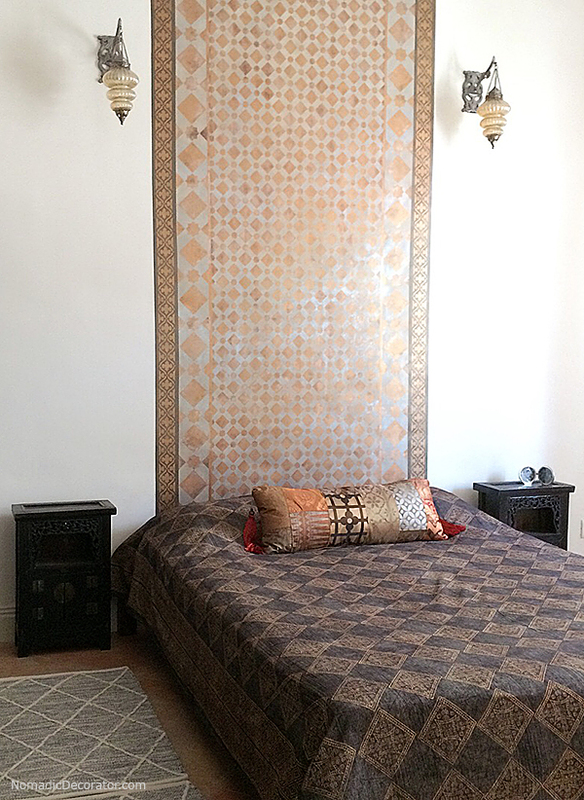 If you want a unique, one-of-a-kind and affordable headboard, how about painting a headboard on the wall? 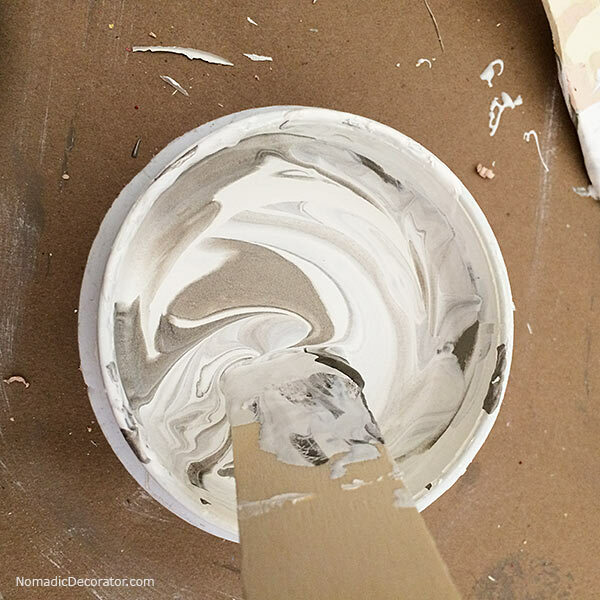 If you like to change decor often, you can easily paint over it to make a new look. You can customize it to the color and design you want. 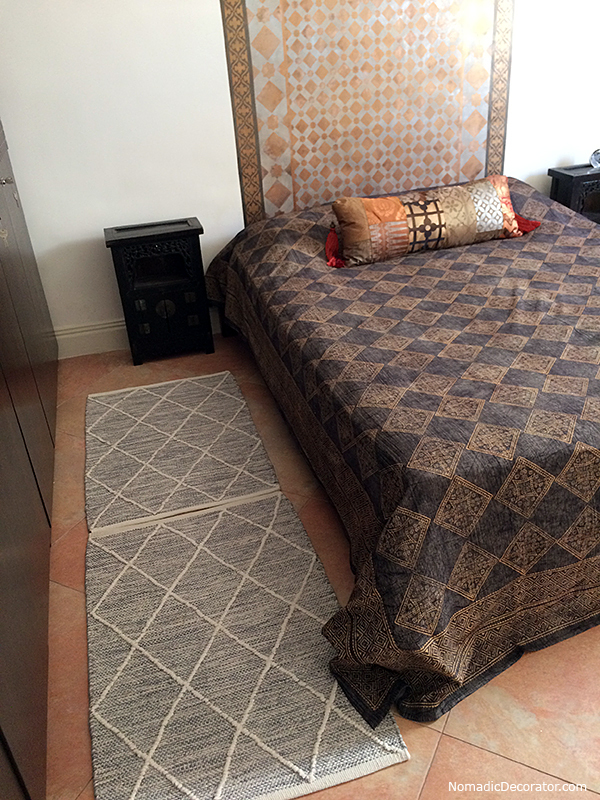 That’s what I did to make a unique headboard in our apartment in India. I’m happy to see this idea come true! Why did it take so long to get things done? 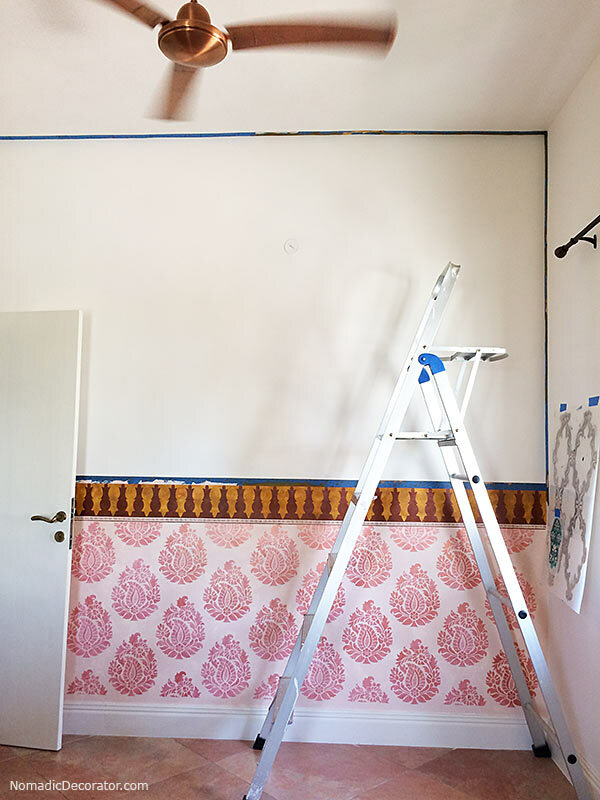 Two reasons: 1) There was a lot of trial and error with architects and contractors from half a planet away, and we got so frustrated that we stopped working on the apartment for a while, and 2) My husband and I both worked full-time so there was limited time to go to India. 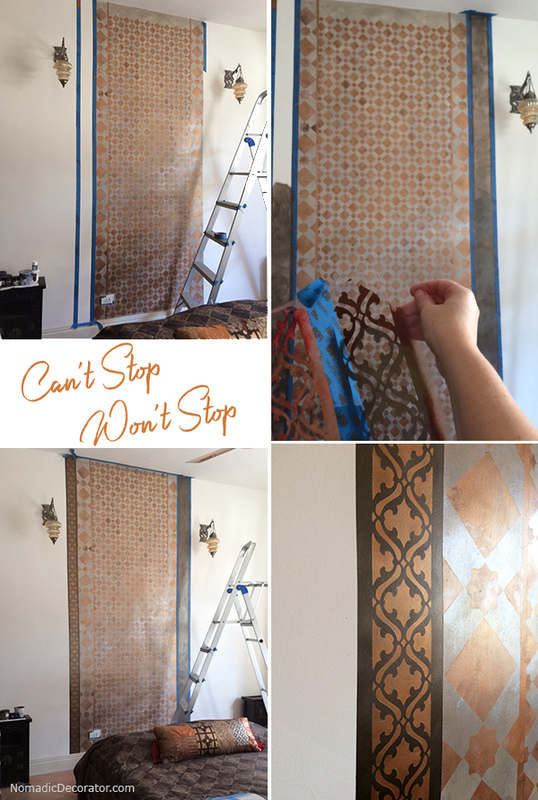 As you’ll see below, I used stencils for my headboard wall. But you don’t have to use stencils. You can paint whatever you want. I mostly hope to inspire you to see a different way to do things than the usual way, which is to buy a wood headboard or upholstered headboard. 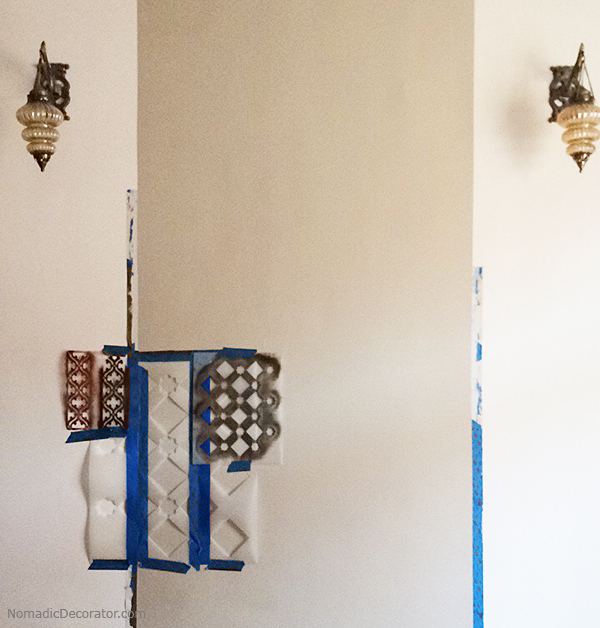 You don’t even have to paint all the way up to the ceiling. 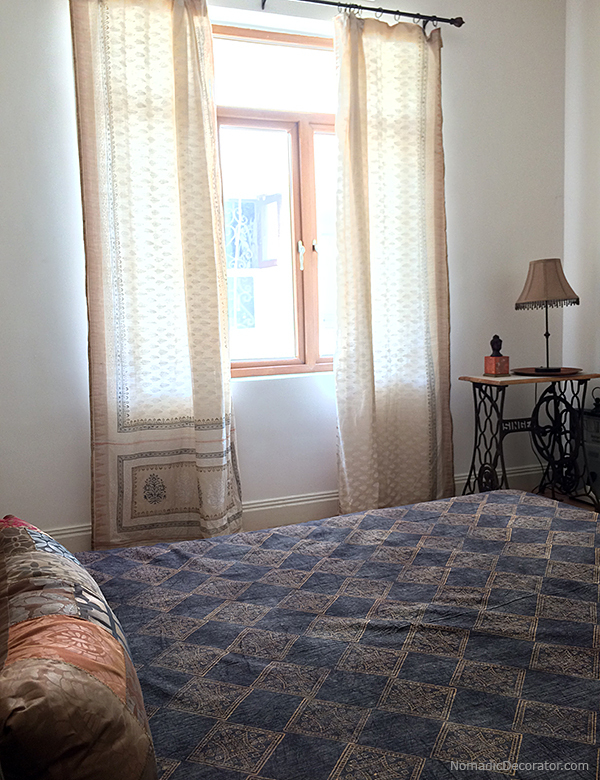 You can paint a square, rectangle, arched or rounded shape on the wall in the area where you usually see headboards. Mother-of-pearl has a metallic quality to it, so I painted with shimmery paints. 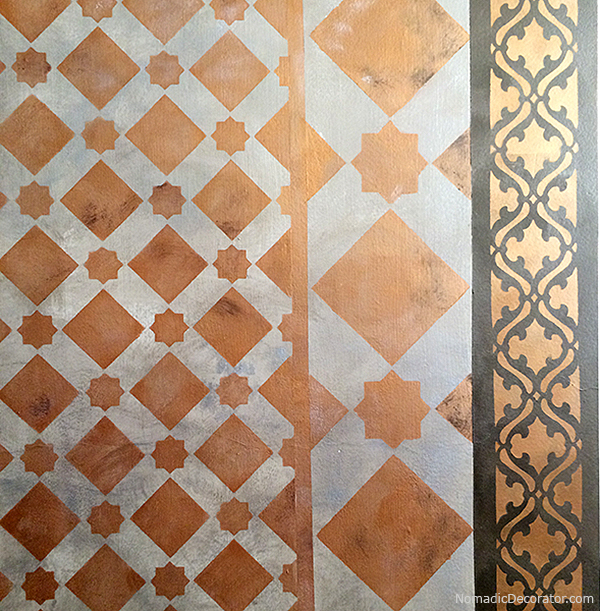 I used Royal Design Studio Stencil Cremes in Bronze Age, Smoked Oyster and Aged Nickel. And I made a custom copper. First, I painted a base coat with a taupe color, Asian Paints Silk Route, back in 2015! 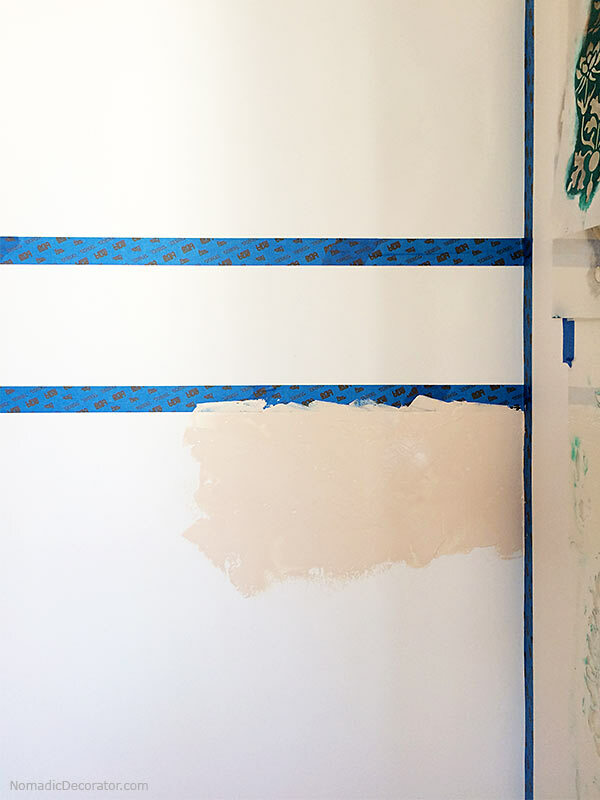 I thought this base coat would make it easier to build rich color than stenciling directly on a white wall. 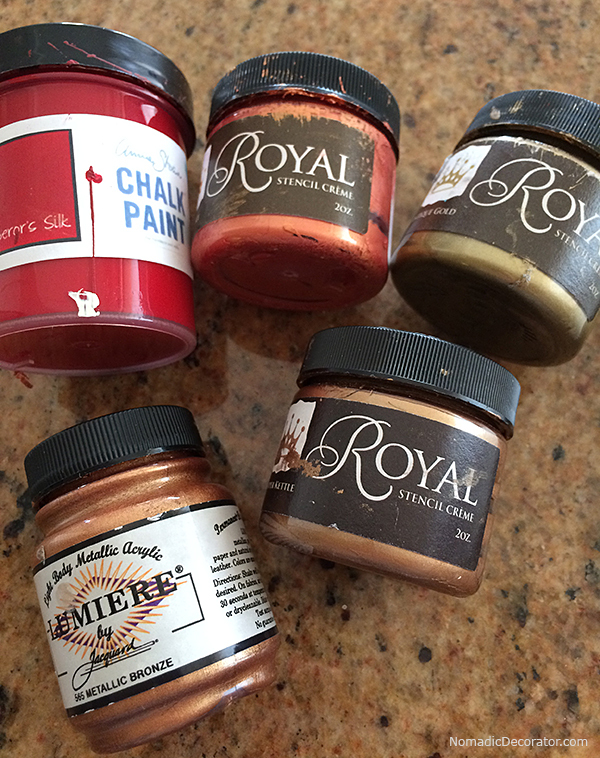 Now, 3 years later, I dabbed and swirled one of the shimmery Stencil Cremes over the Silk Route paint. I think this was Aged Nickel? Or it could have been Bronze Age. I’m sorry I didn’t keep notes. It’s a little blotchy but that gets covered up a lot by the stenciled pattern. So many of these photos will be bad, I admit it! I painted most of this at night with bad lighting. The lighting was even worse than usual because one of the wall sconces stopped working. This is 10 feet tall! It’s hard to tell by the photos how tall it is. It took many hours to fill in the whole pattern. I had two of these small diamond stencils, so I could work in two areas at the same time while paint dried. Almost done!! After painting all night until about 4 a.m. I remember being really sick and coughing so hard it hurt while painting this. Why keep painting? There was limited time before I had to go home to Chicago. And I’d already waited more than 7 years to paint this! So I didn’t care how sick I was. I decided not to climb to the top of the ladder and finish that top row at 4 a.m. when I was so tired and sick. I left it for the next day. The scrolly pattern is a custom stencil cut with my Cricut Explore, with a vector illustration purchased from Shutterstock. Ahhhh! This feels better! It feels done! Are there enough diamond shapes here?! It’s a little thing, but this view made it all worth it! It’s furnished simply. We spend only a few weeks a year here so we don’t need much stuff. And everything gets very dusty in India, even indoors, so the less stuff we have, the less stuff we have to clean. Some walls still need more art. But the “headboard wall” is complete. Finally. 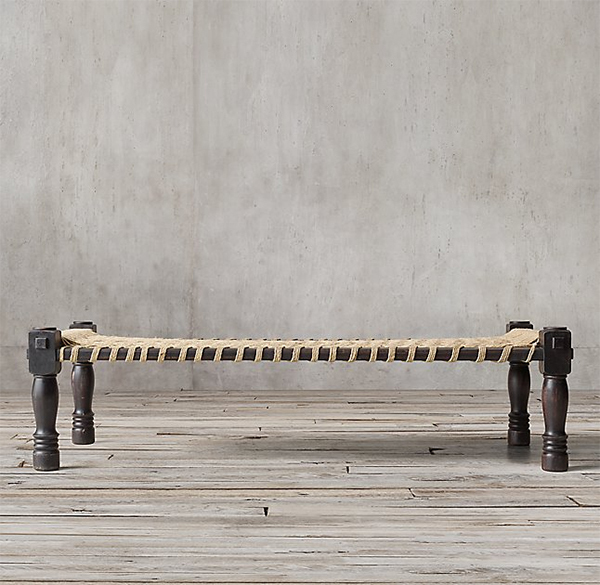 We got that cute low table with the little cushioned seats from an Indian online shopping site, Urban Ladder. It’s their Kivaha table. The table is supposed to be in the living room as a coffee table. But this entrance area was so woefully empty, and I needed to photograph this wall I painted, so I styled up the tiny bit of furniture available. The focus of this photo was mostly the wall, anyway! 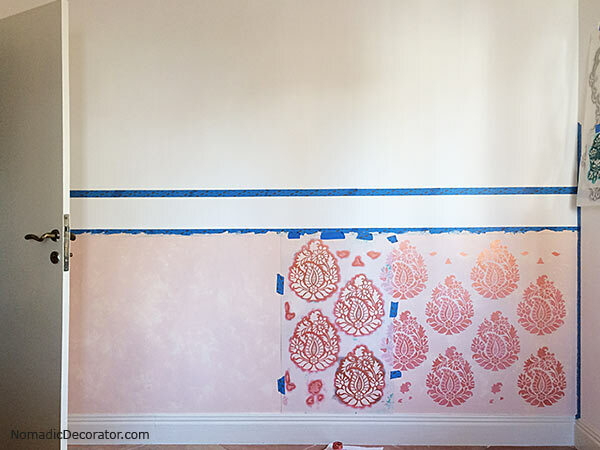 See how to paint a wall to look like this, visit my tutorial at Paint+Pattern. 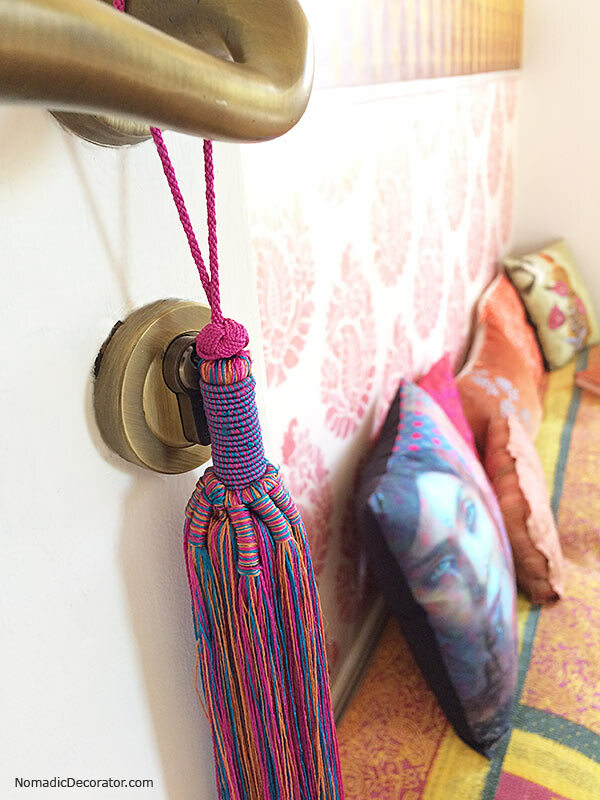 And click here to see how to make those hanging lanterns. Yes, these lanterns can be easily DIY’d! And of course, I would paint stencil designs on more fabrics to make pillows. 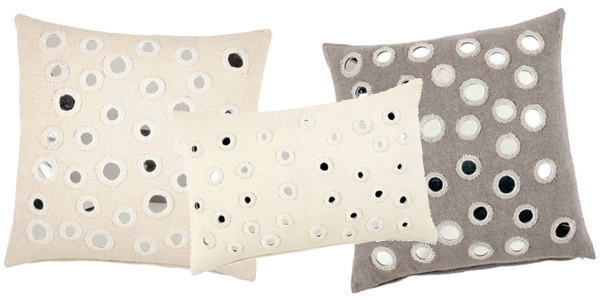 I’d look for white embroidered chikankari fabric to make pillows. Maybe cream or light gray or white sari fabric or cream color sari borders too, if I can find such a thing in colorful India. 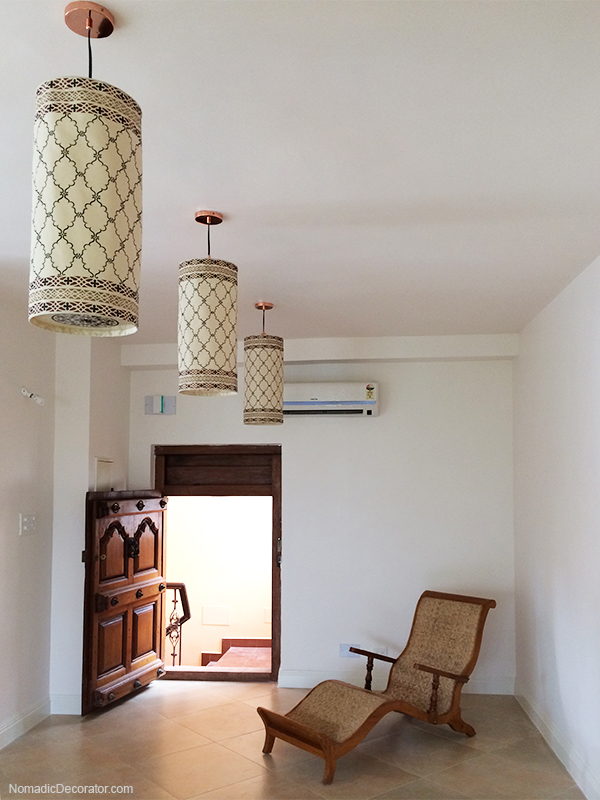 You see, I’m keeping the apartment light, like Scandinavian white in India, as shared here in a post years ago. 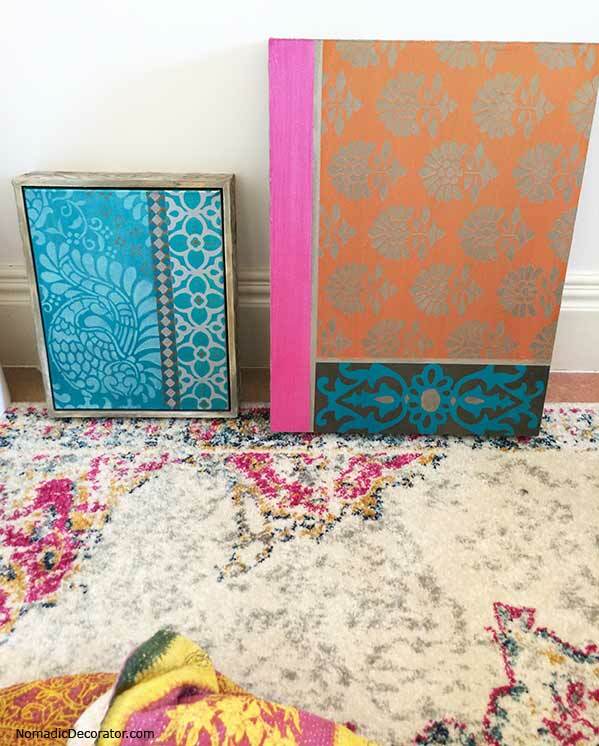 I have packages of Darice mirrors found at Joann, and yeah this pillow will be another DIY. Maybe I’ll sew the mirrors in rows over painted stripes. We’ll see! 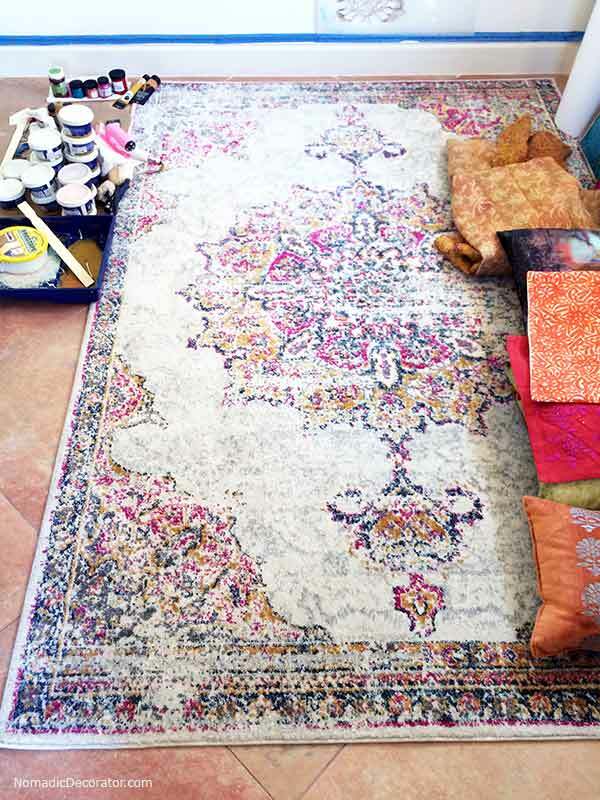 The end goal is a charpoy with a riot of patterns, with quieter colors. But this dang mirror! I bought it many years ago and since then it’s lived in our basement and a storage unit. It’s JUST a smidgen too big to pack for checked luggage on Etihad without incurring big extra fees. Ugh! And the mirror really can’t be disassembled without damaging it a lot. Believe me, I’ve thought of all ways to get this mirror to India. But I’ll figure out a way sometime, that’s for sure! 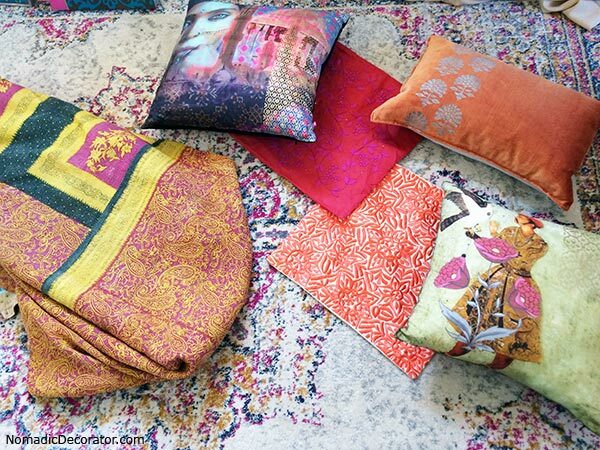 I thought that rug would look great with the charpoy, cushion and pillows. 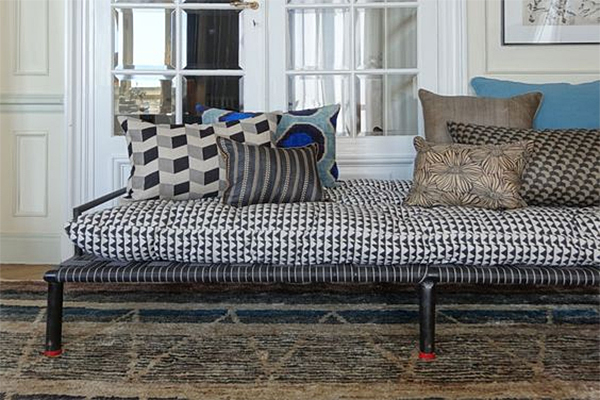 Hopefully after our next trip, there will be a very pattern-full charpoy piled with cushions and pillows here! And yes, you can paint on fabric to make your own designs. 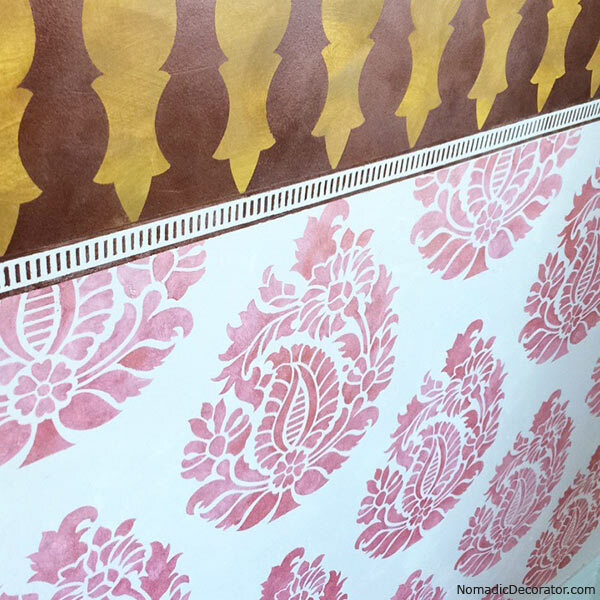 See links to a whole bunch of stenciled fabric projects I’ve done, in my post about how to be a fabric designer with paint and stencils. And oh boy … in addition to looking for a charpoy, I have a lot of DIYs to do on our next trip, huh? Nothing like trying to sleep with a bright light bulb shining in your face. Imagine the bright bulb is not in your room, but it is in the NEIGHBOR’S house! And it’s shining into your bedroom through open windows. That’s what happened to us in India this summer. If you’ve ever been to India, you know that flavors are stronger, sounds are louder, the heat is hotter, colors are brighter and … well, actually, light bulbs do not shine brighter in my experience. Except for that one light bulb the neighbors have shining 24/7, right outside our bedroom window. Of all places, why there?!? This single light bulb had the power to render eyelids useless. And there are privacy issues of course. It’s hard to drift off to happy dreamland when you worry about someone peeping in the window only three feet away. 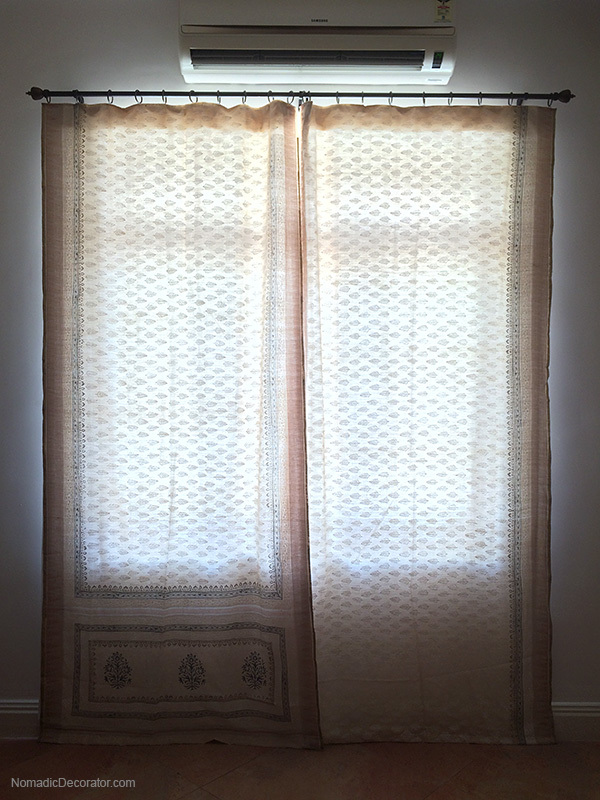 The window was naked because curtain rods were not installed yet. So we draped a saree over an open ladder. Classy times. That blocked 60% of the window. It was enough for the weary to get rest. 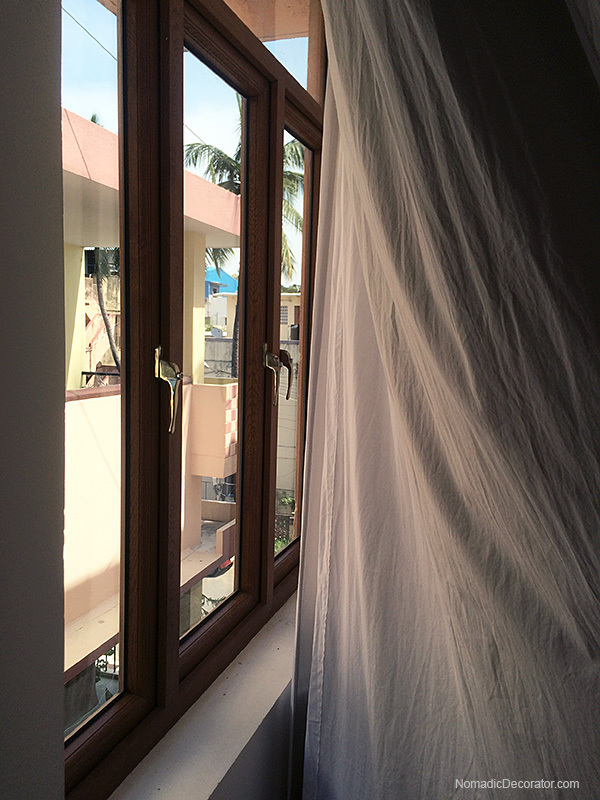 The next day, a few guys hung curtain rods on all of our windows, and I turned that saree into actual curtains. I know there are many readers here from India who wear sarees, and please forgive me. I do worry that what I’m about to suggest is like suggesting we turn my clothing into curtains. But it’s so tempting. Sarees can have 18 and more feet of fabric, about 3 feet wide. And many are so beautiful. I know people will drape them over four-poster beds, people will drape them down walls, so why not drape them over windows. 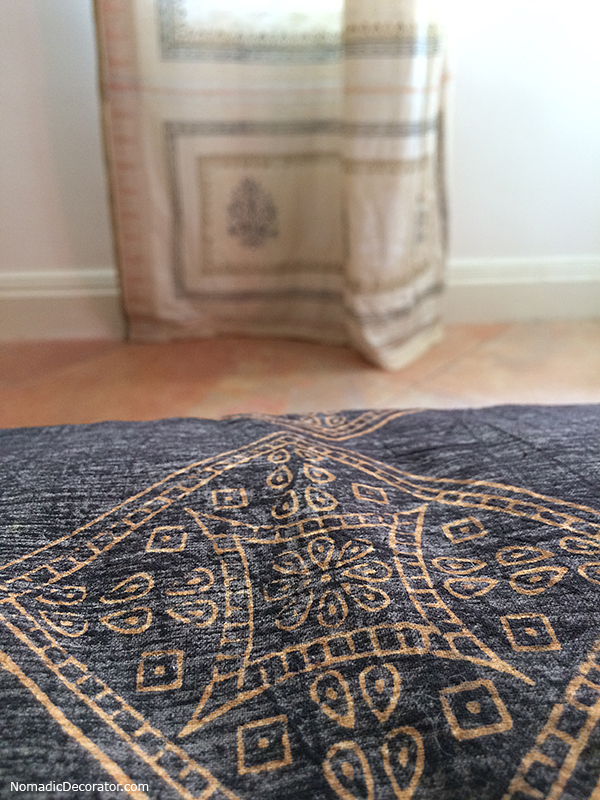 It’s a simple beige silk, with white, gray and gold block printing and copper metallic thread accents. 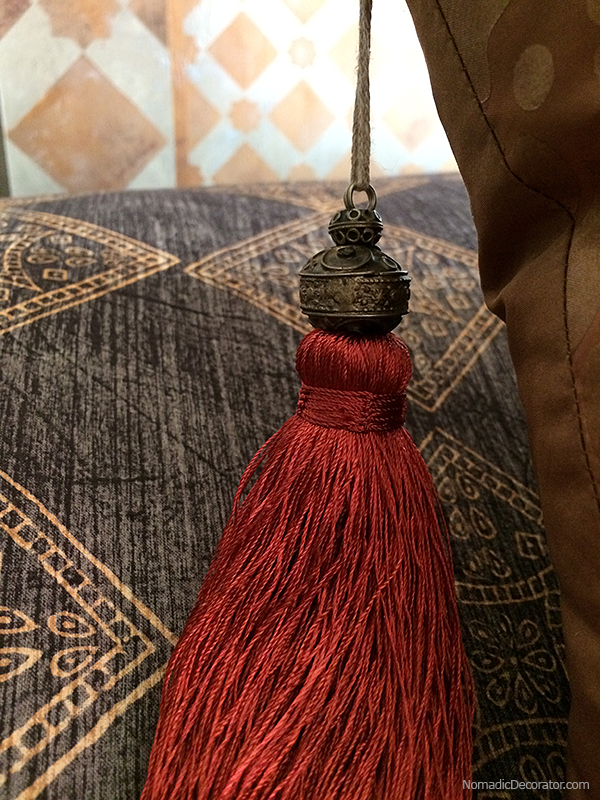 I bought it at a Craftmark silk show in Chennai many years ago. 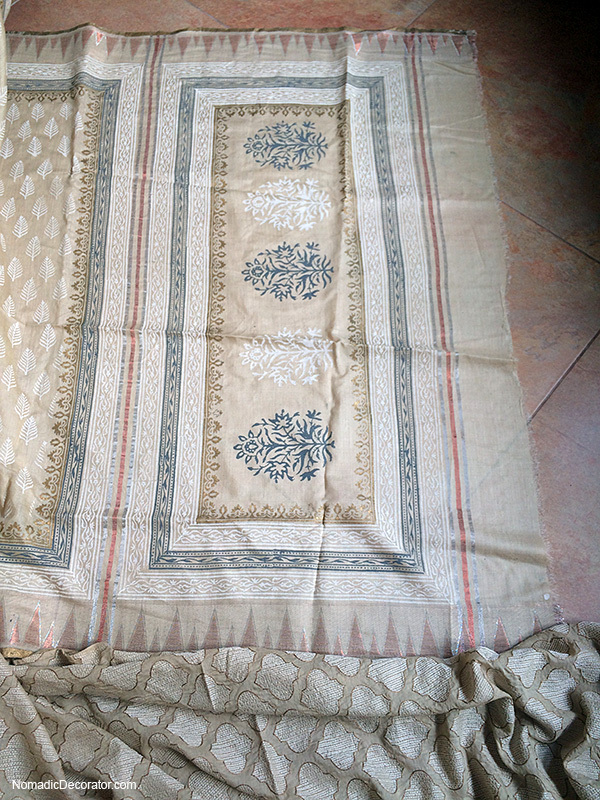 First, I sewed white cotton into lining, We found the plain white cotton at Nalli saree store in Panagal Park, Chennai. 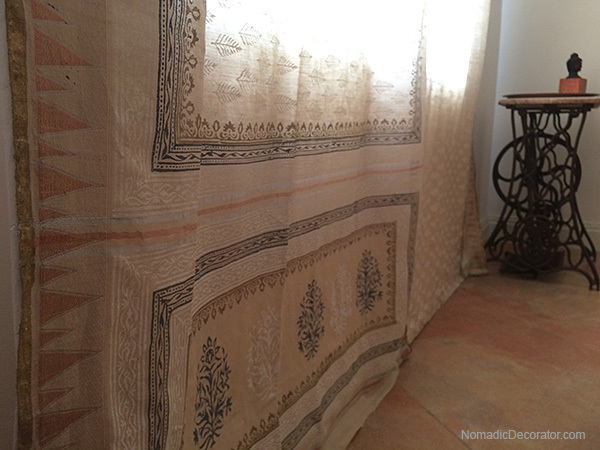 Let me tell you, it is not easy to find plain unadorned non-textured white fabric in India. It’s quite the hunt. And you get interesting looks when you describe what you’re looking for. Like, why?!? 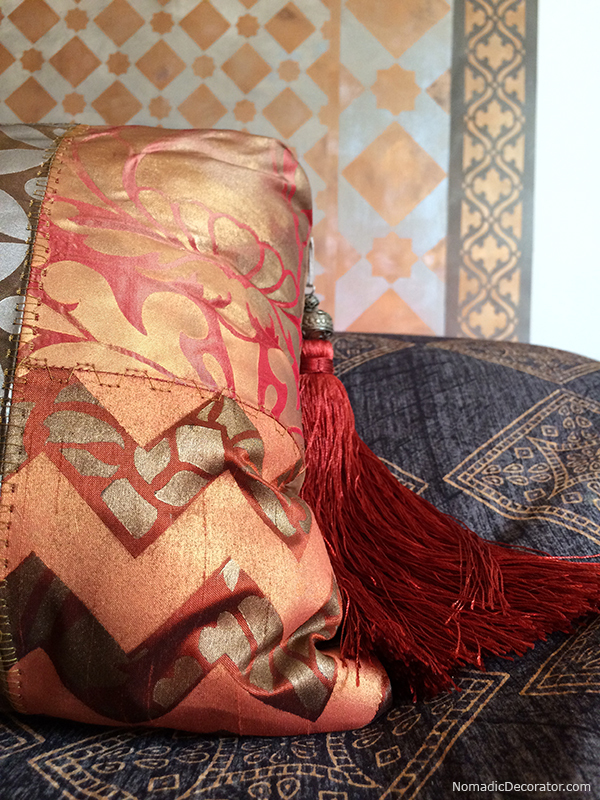 Given the millions of colorful, patterned, textured choices in India … indeed, why, except curtain linings should be as plain as possible. Sewing the lining is simple. You sew down the sides, sew the top, sew the bottom. 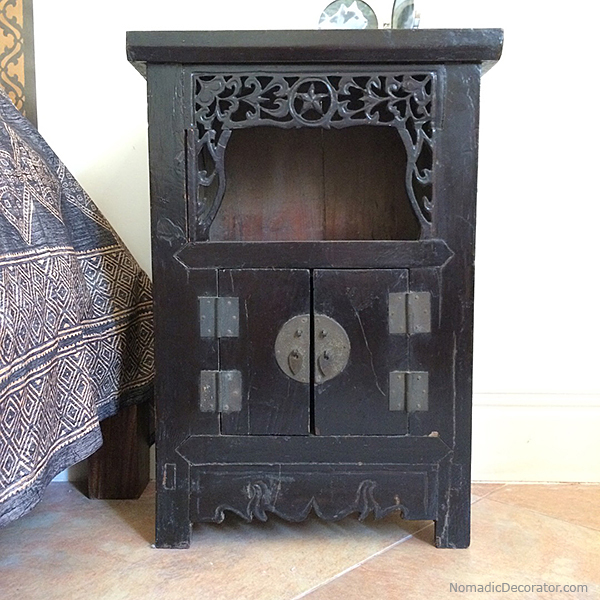 I sewed on a vintage Singer machine stand we found in India (tailors have them on roadsides everywhere) and I brought my machine from the U.S. in a suitcase! We had to get an electrical transformer that weighs about as much as a rickshaw, to allow me to use the machine in India. The biggest problem is wrestling with such large lengths of fabric, and keeping lines straight over the long haul. Be vigilant to ensure straight lines don’t creep into becoming crooked lines. Measure with a ruler and pin all seams. 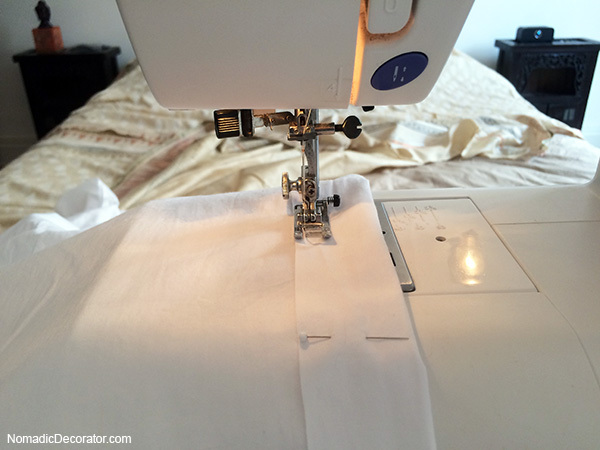 Your eyes can fool you into thinking you’re folding straight lines over many yards of fabric. A ruler will keep you honest. And also, boredom. This was about as much fun as sewing hospital bed sheets. Thrilled to move on from this boring task, I didn’t want to spend any more time with it to iron it. So the lining is wrinkled, but they face the outside so this isn’t noticeable. 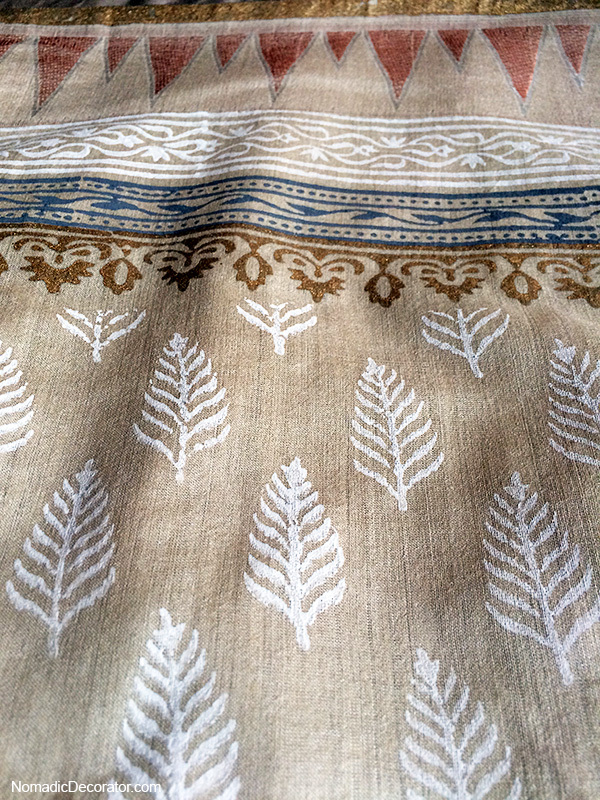 For the saree, sewing was simpler because the selvedges made the right and left sides. Seams were needed only at the top and bottom hem. The hardest part here was ensuring both pieces of fabric wound up the exact same length. Measure. Then measure again. Then measure again. Measure one more time. You will probably have to measure yet again. This will happen when the first panel is sewn and the two panels are no longer the same length. They were before. But they’re not now. You may want to punch something. Don’t. Measure instead. Make it zen. Turn on 80s dance music. Whatever you gotta do to deal with it. Remove pins from the second panel, measure, pin again, then measure again. Then measure again. Measure one more time. 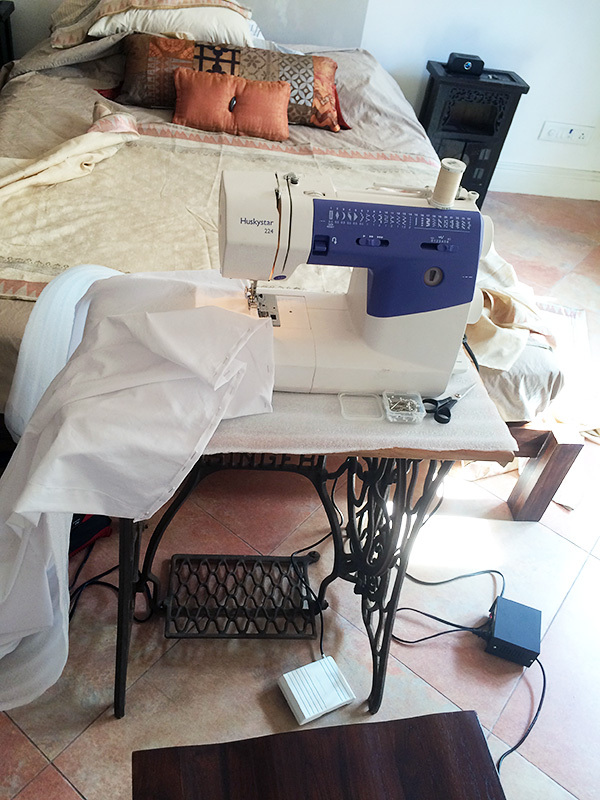 Measuring took more time than sewing! This is what I did for a whole day of my vacation in India. 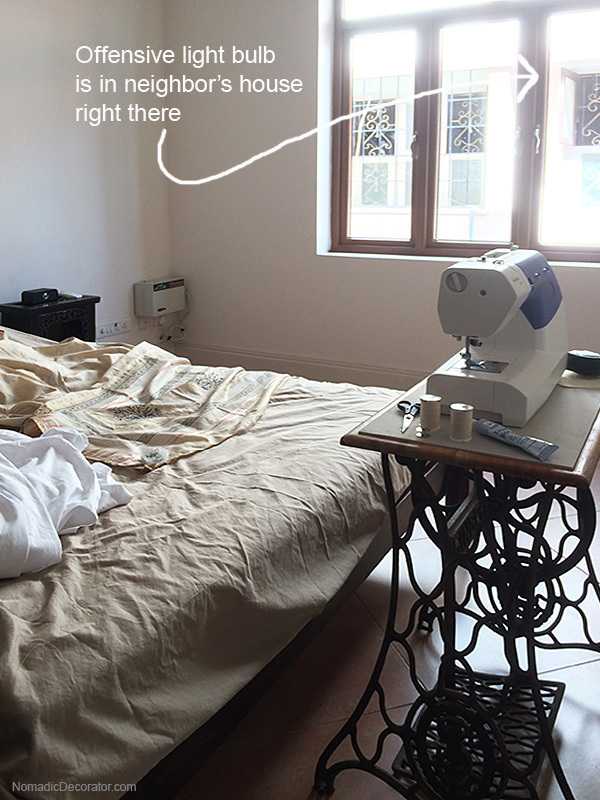 Pinning, measuring, sewing. Great times. But the final result was … no more brightest-lightbulb-in-the-world shining through our naked window, and fears of waking up at 3 a.m. to see a face peering in. One day of work, many nights of peaceful sleep. It’s a fair trade. 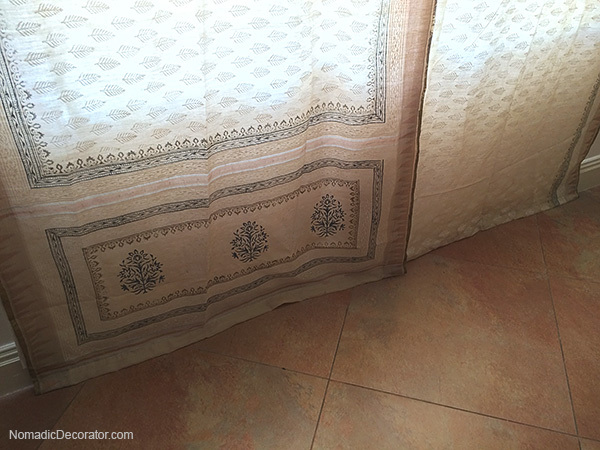 Leaving part of the pallu design on one side was necessary to get the right length. (The pallu is the part of the saree that hangs straight down when draped over a shoulder.) I thought it would be like an irreverent cast-all-rules-out-the-window kind of look. It says I’m willing to break the curtain molds that bind us. But it is bothering me now. I might replace the bottom of the left side with the blouse fabric. It won’t be the same design as the right side, but it will be a contrasting border, and it might help this situation feel more balanced.